SLEEPY BUNNIES GALORE! 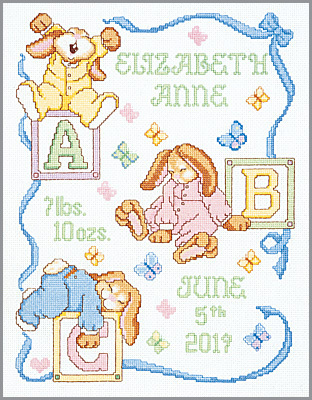 Fall asleep playing with blocks on this COUNTED Cross Stitch birth sampler design by ©Terrie Lee Steinmeyer. A favorite for many years. Each kit contains 14-count White cotton Aida fabric, 6-strand Carded cotton floss, needle, graph and instructions. Alphabet and numbers included for personalization. Stitch Area: 135W x 175H. Size: 11" x 14" (27,9 x 35,6 cm).